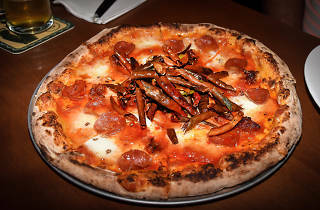 A cosy neighbourhood joint perfect for Kennedy Town, Alvy’s serves up good pizza and good drinks in equal measure. 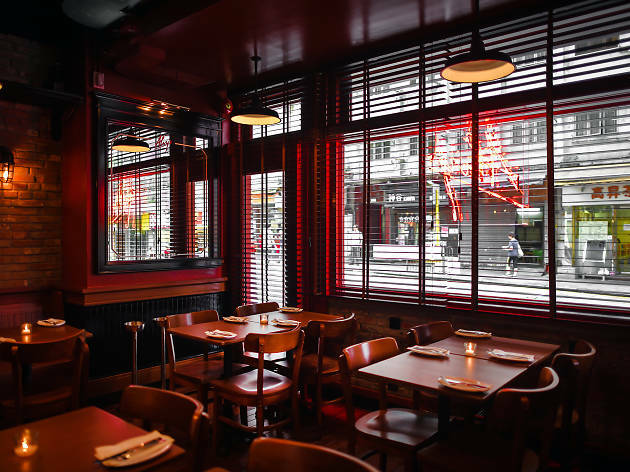 The venue is perfectly reminiscent of a casual New York neighbourhood bar – another success by designer Paul Gelinas, who nailed the neighbourhood gastropub vibes at May Chow’s Second Draft in Tai Hang. First up for food, we order a trio of schmears. Our order – which includes mortadella spuma with five spices, smoked eggplant with chilli oil, and caper créme with lox and salmon roe – comes with a side of lightly toasted sourdough. Each schmear was equally delicious: the mortadella was pâté-like and well seasoned; the eggplant schmear was like a fiery babaganoush; and the latter was reminiscent of a classic NYC bagel filling. 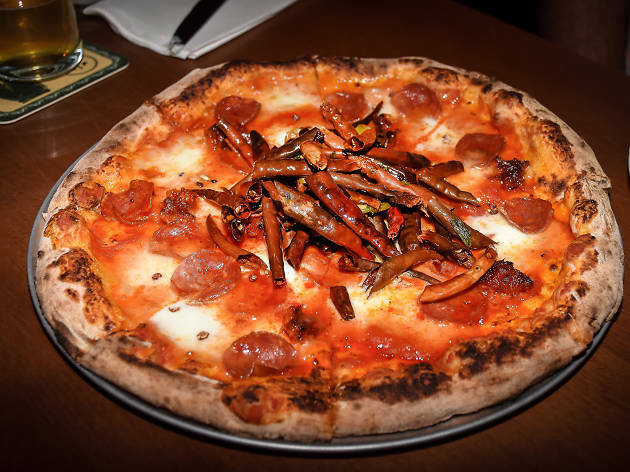 Looking to see how Alvy’s makes use of local flavours in its pizzas, I opted for the Bak Gwei, that’s topped with gruyere béchamel, mozzarella and char siu. The sourdough base was chewy and satisfying, robust enough to hold a mighty load of cheese. The cha siu was tops too, the only issue being that the chunks of pork were small, meaning the sweetness gets drowned out by the cheese. Still, a good slice can be hard to come by in this city and Alvy’s serves one of the better pizzas. It’s not all about the food, though. 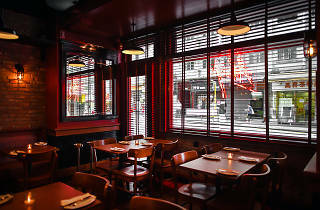 The drinks menu is impressive, with a large selection of Young Master craft beers, rarer imported brews, cocktails, natural wines and Hong Kong's’s most extensive collection of American only craft whiskeys. We selected the Cucumber Hippy draft to quench our thirst, which has appropriate sweet cucumber notes with a slight citrus kick. Taken along with a George Dickel rye chaser, these tipples demonstrate that Alvy’s is more than confident of holding its own as a bar, too.